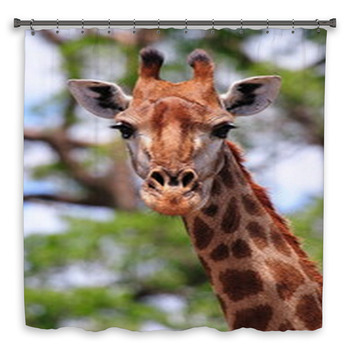 Put a giraffe on your shower curtain and let it look over your shoulder while you get ready in the morning. 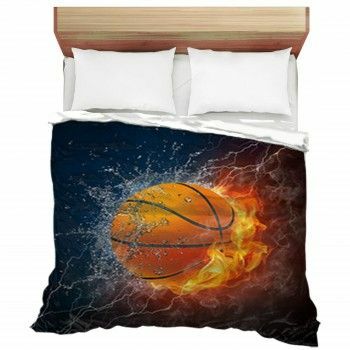 Its wondering if you really need all that makeup. 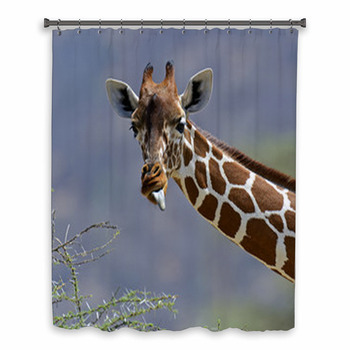 Let a pair of giraffes cross necks against steely blue skies with beautiful green spread beneath them across your shower. Let one nuzzle against another in skies of pale blue. 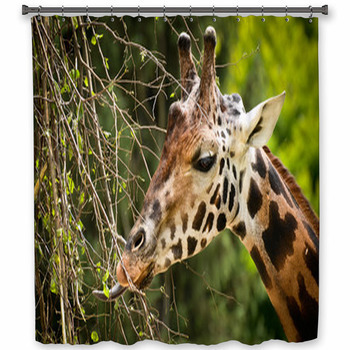 Hang some fresh green tree tips for a young giraffe to nibble. 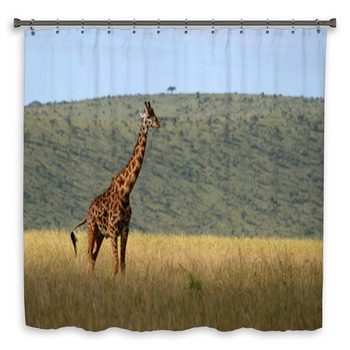 Leave one in a blurred mist of pale sage, beige, and grays of an African savannah. 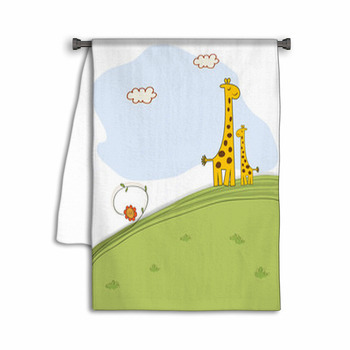 Put the fuzzy schnoz and long eyelashes of a giraffe on a custom size towel. 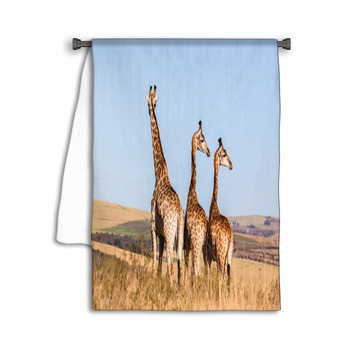 Or turn your towels into a collection of black giraffes silhouetted against golden sunset skies in different designs. 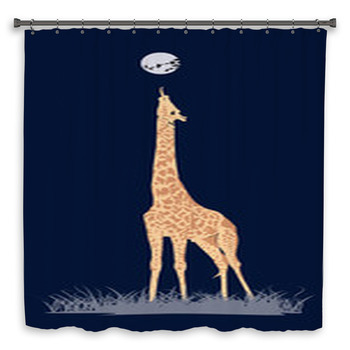 Turn your bathroom into a haven for giraffes with these custom designs. 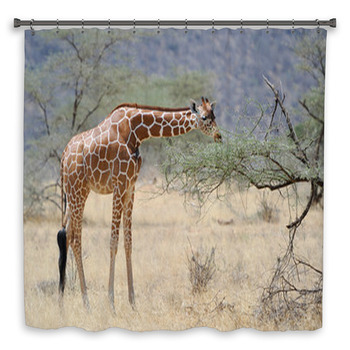 Let their butterscotch necks cross high above emerald green forests blurred in a teal mist. 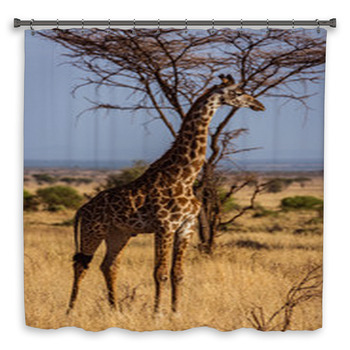 Leave them under dusty clouds on a golden tree with the branches of an umbrella thorn tree sprawling across your giraffe themed bathroom walls. 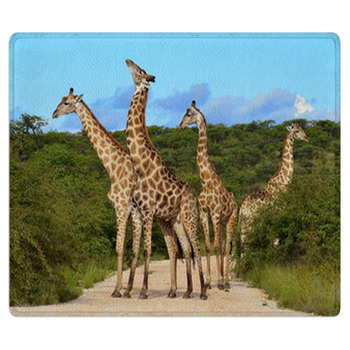 Leave them by a dirt road in a Masai National Park on a custom bath mat. 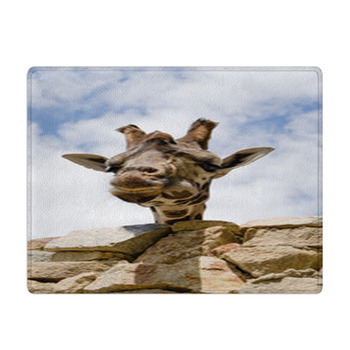 March them across the lime green of an African jungle looking like they stole the spots off leopards, or let them gallop across parched copper plains. 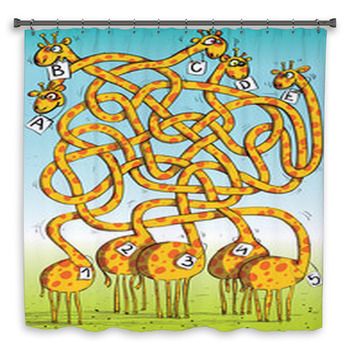 From a trio of giraffes ending the day against fuchsia skies to giraffe hide up close, its beige lines against swirling browns, these designs will give you giraffes to look back at and leave standing above a bright blue river curving through green plains.